Posted in: Art, Music, Photography. Tagged: 1898–1983, 1942, American, Coccoloba uvifera, Graphite on paper, It's a Beautiful Day Today!, Marina Cay--- B. V. I., Moby Grape, Ross Eugene Braught, Sea Grape. 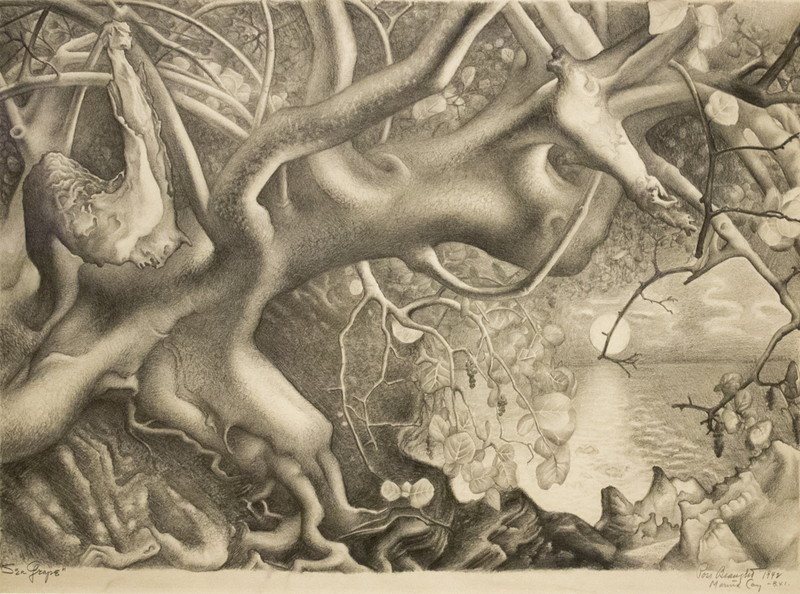 "Ross Eugene Braught's large graphite on paper drawing Sea Grape, Marina Cay--- B. V. I., 1942, describes the accutely observed twisted trunk; curving branches; smooth, slightly-mottled bark; and round, leathery leaves with prominent veining associated with the tropical tree known as the sea grape. The sprawling tangle of branches in the foreground of the composition opens up in the lower right to reveal a view of an uneven, sandy shore. Beyond the beach with its small wind-shaped dunes , the calm waters of the Caribbean lagoon are lit by a full moon that has just started its rise in the cloud-filled night sky." I am so close, I may look distant. So completely mixed with you, I may look separate. So out in the open, I appear hidden. So silent, because I am constantly talking with you. Thanks so much, Maverick for posting your description of art, it is so helpful and increases awareness. Thanks Megha, most of the credit for the descriptions goes to the gallery. then thanks for curating them. Award free but thank you for making me a nominee.